Strategic alignment is impossible without clear and timely communication. 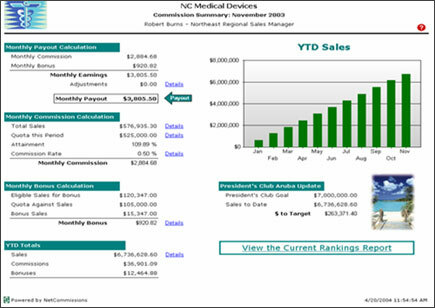 At NetCommissions, we recognize this and offer the most advanced reporting solutions available. Customers leverage our on-line data management utility to securely upload information (such as results, territory, quota, goals, relevant performance measures, sales transactions, etc.) into the NetCommissions 'Quick Start' data model. All Reporting services leverage this information in an economical and efficient way. Management Reports leverage the hierarchy and security information that is implemented during start-up to provide managers visibility into the performance information of subordinates. Report templates include commission summaries, ranking reports, bonus reports (club, individual, etc), and commissions plan documents. Payee Reports (payees are individual contributors such as sales people, employees and partners) provide a critical tool for reinforcing strategic goals and motivating behavior across the organization. Report templates include commission summaries, ranking reports, bonus reports (club, individual, team, etc), and commission plan documents. Analyst Reports provide compensation analysts with all the relevant commission and organizational data they require to deliver accurate and timely commission payments. Subscribers can access web reports through the NetCommissions portal. When new reports are generated, e-mail alerts with embedded links are sent to all payees who simply have to click on the appropriate embedded links to be routed to the NetCommissions portal. Here they can log in using their unique username and password, granting them secure access to their own timely incentive compensation information. NetCommissions can provide customers with reports that can be distributed to users of company portals. NetCommissions offers an e-mail distribution option that allows you to circulate reports to payees as e-mail attachments. NetCommissions offers the option of circulating incentive compensation information through the postal system. This service is attractive to firms who may have payees that may not have Internet access. NetCommissions will manage all aspects of mass mailing the hard copy reports.